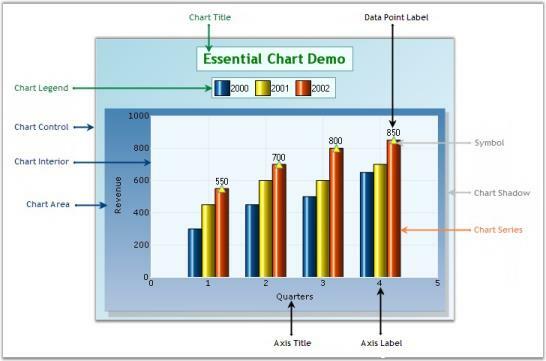 EssentialChart is an easily configurable, presentation quality business chart control. A unique point based Styles Architecture, easily extendable Data Model, easily extendable rendering model, native Date Handling and a unique Shared Data Model are the features that distinguish Essential chart. This control has been created using C#, which means that it is a fully-managed .NET component, and has been specifically designed for use with Microsoft’s Visual Studio .NET. EssentialChart for Windows Forms is a perfect solution for developers looking to add advanced, feature rich, visually appealing charts to their Windows Forms applications. The product comes with numerous samples as well as an extensive documentation to guide you every step of the way. Chart is used as a means to show the graphical representation of two values. For Example, a Line Chart can be used in health Statistic reports, in which it can show the rates over time or for a series of values, such as age-specific death rates. Logarithmic charts can be used in Share price charts where we plot between price and time. In logarithmic chart, we can identify the ‘Proportional change in price’ with respect to the ‘Change in time’. We use ‘Proportional change in price’ to observe market sentiment. Market participants move share prices either up or down proportionally depending on how bullish or bearish they feel. Some of the key features of Essential Chart are listed below. The control provides complete support for customization of the Chart control through Chart Wizard at design time and also at run time. Chart Wizard comes with new Office look and feel. Chart Data Model is an innovative data object model which makes it easy to populate the chart with any kind of data source. Essential Chart features built in support for dates. The data type of any series that is plotted on the chart can be set to DateTime. Essential Chart offers automatic interval calculation capabilities for any range of numbers or dates. This calculation can be overridden by explicit allocation of ranges and intervals to be used and also with settings that control how ‘nice’ numbers are calculated for display. Essential Chart offers extensive customization possibilities of the legend. The position of the legend on the chart area as well as its representation aspects can all be completely customized. Essential Chart also features modification of legend items using events. It also supports custom legend items that are not tied to series of data. Statistical formula means, Standard Deviation, Variance, Distributions, T-test, F-test and Z-test support etc. 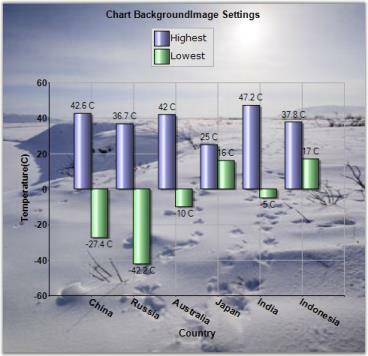 Exporting Chart to PDF, Excel and Doc etc., are available for the chart control. Importing is also supported. Users can create custom palettes for their Charts using CustomPalette property. Also, can create non-gradient palettes for the Charts using this custom palettes feature. Multiple Chart Titles and Multiple Legends can be provided with abilities to format the Title text. Chart Breaks are very useful when you use series points with large difference. This section covers the requirements mandatory for using EssentialChart control. It also lists operating systems and browsers compatible with the product. The prerequisites details are listed in the following table. The compatibility details are listed in the following table. This section gives you an idea of the different sections of a Chart control. Below is the image that illustrates various sections of the control and their description in detail below. The ChartControl is the complete visible display for the Control. All other sections will be inside the ChartControl. The Chart title is the area at the top of the Chart control that displays the text of the ChartControl. The Chart legend is the portion of the display showing an entry for each of the data series added to the ChartControl. The Chart legend is positioned in line within the ChartControl (but outside the ChartArea) by default. However, if the chart legend is set to floating mode, the Chart legend can be positioned anywhere inside the Chart control. The legend can also contain custom items with custom image and text. This is the section that holds the plots / graphs that are defined in the Chart. The Chart Area also includes the Chart axes that are defined. A primary X axis and primary Y axis are defined by default. Indicates the title for individual axis. Represents the label texts on the axes data points in a Chart. This section is the interior part of the chart control, within the chart area, which contains the data points plotted against X-axis and Y-axis. Chart Series are the elements present inside the chart area. Symbol that can be placed on the series points. Chart Area Shadow indicates the shadow of the chart area. Syncfusion provides the following documentation segments to provide all necessary information for using EssentialChart control in Windows application in an efficient manner. link. Select Chart from the second text box. Namespaces will be listed out at the left side of the page.